For 10 days, the sporting flame lit up Turkmenistan’s capital Ashgabat. It became the first city in Central Asia to host the Asian Indoor and Martial Arts Games, bringing together 6.000 athletes from across Asia and Oceania. It is so important for me, I have got the gold medal! 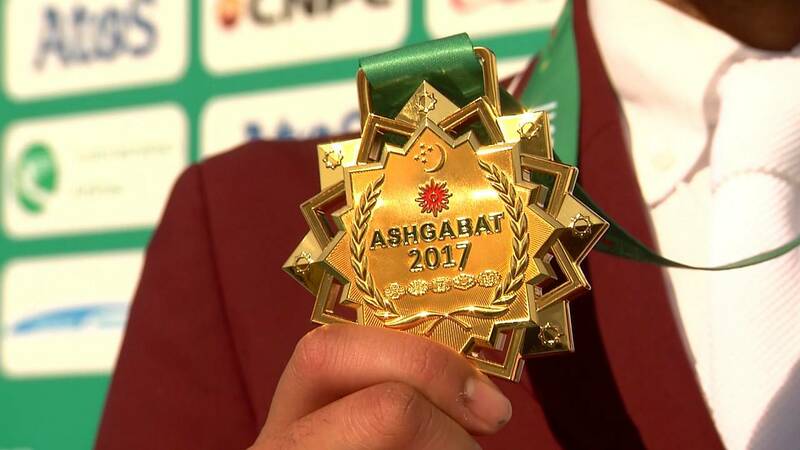 Indian Team concludes their campaign with whooping 40 medals at Ashgabat Games. This 5th edition saw more than 340 medal events, a new world record, and the rise of new sporting stars. The Games opened with a spectacular ceremony, featuring more than 7.000 performers from 39 countries. The show’s producer was award-winning stage director Francisco Negrin. “As Turkmenistan was at the centre of the Silk Road – all the commerce routes throughout history between all the countries in Asia – it was easy to make the metaphorical link with sports now coming on this new silk road, if you like, to Ashgabat,” he said. The flame travelled across the country for 500 days on horseback before reaching the arena, built especially for the occasion. It was transported on the back of Turkmenistan’s famous Akhal Teke horse, in scenes reminiscent of the epic legend of Gorogly. “It has the same colour and looks exactly like the legendary horse, and it has the the same character,” said equestrian performer Pygy Bayramdirdiyev. One of the oldest equine breeds in the world, the horse featured in the Games’ new programme, in the Akhal Teke horse jumping competition. Another sport featured for the first time was Belt Wrestling, which dates back to Ancient Mesopotamia – a sport in which Turkmenistan fared best. In the final medal count, Turkmenistan came out on top ahead of China and Iran. China’s swimmers did particularly well. Nineteen-year old Lizhuo Wong broke two Games records, in 50 and 100 meters breaststroke, winning a total of three gold and two silver medals. “It is so important for me, I have got the gold medal! I was afraid to come in second, the first 50 meters were tight, and now I am so happy,” said the young champion. In weightlifting, Iranian Olympic champion Sohrab Moradi won gold, setting a new record of 413 kilograms for a combined total, and breaking the longest standing world record in the sport. In the final days of the Games, the venues beat to the rhythm of salsa and chachacha. Vietnam’s Trung Kien Nguyen and Hong Anh Pham scored a surprise victory, having only learnt to dance salsa a few months earlier. “Two month ago we started salsa with my teacher in Vietnam, but it was so hard. I am very very happy, I want to jump, I want to dance,” exclaimed Pham Hong Anh, before performing a little victory dance for the camera. What a ride! That’s it for #Ashgabat2017, but stay tuned for more pics soon!